Bitcoin is gaining momentum after a strong bounce off the rising channel support visible on the 1-hour chart. Price has climbed past the first two Fibonacci extension levels and could be looking to test the swing high next. This is in line with the 61.8% Fibonacci extension level at $4,125. The channel resistance is closer to the 78.6% level at $4,177 and the full extension is at $4,242.3. However, 100 SMA is still below the longer-term 200 SMA to indicate that the path of least resistance is to the downside. In other words, there’s still a chance that bearish momentum could stay on. RSI is heading lower from the overbought zone to signal that selling pressure is just about to pick up. Similarly stochastic has just recently turned lower from the overbought zone and has plenty of ground to cover before reaching the oversold region, which suggests that sellers could stay in the game for much longer. In that case, another test of the channel bottom around $4,000 could be underway, and a break below this might still spur a reversal. The strong rebound off the $4,000 key area of interest seems to have been enough to revive confidence in the coin, as well as other cryptocurrencies. Many are still predicting that BItcon could reach as high as $5,500 in May when more developments kick in and central banks are rumored to be stocking up on digital assets as well. However, this move seems to have been accompanied by low volumes and no actual industry developments, so profit-taking could be as quick as in previous instances. During the week we will consolidate above $ 4,250. I’m sure of it. Opened a long one. I think it’s too early to buy more, I would wait for the correction. At what price do you plan to go? Ripple price climbed sharply and tested the $0.3750 resistance before correcting lower against the US dollar. The price corrected below the $0.3600 and $0.3480 support before buyers appeared near $0.3280. Yesterday’s highlighted important bullish trend line was breached with support at $0.3600 on the hourly chart of the XRP/USD pair (data source from Kraken). The pair must stay above the $0.3300 support and the 100 hourly SMA to bounce back. Ripple price corrected lower sharply after a strong rise against the US Dollar and bitcoin. XRP tested a crucial support area and it remains well bid on the downside above $0.3300. There was a strong upward move above the $0.3480 resistance in ripple price against the US Dollar. The XRP/USD pair surged above the $0.3500 and $0.3600 resistance levels. The price traded close to the $0.3750 resistance and settled well above the 100 hourly simple moving average. Later, there was a downside correction, but the $0.3480 support acted as a buy zone. There was a fresh increase, but the price failed again near the $0.3750 resistance area. As a result, there was a sharp decline below the $0.3600 and $0.3480 support level. Moreover, yesterday’s highlighted important bullish trend line was breached with support at $0.3600 on the hourly chart of the XRP/USD pair. The decline was such that the price even spiked below the $0.3400 level. It tested the $0.3280 support area and the 100 hourly simple moving average. A strong buying interest emerged near $0.3280, resulting in a rebound above $0.3400. The price broke the 23.6% Fib retracement level of the recent decline from the $0.3746 high to $0.3281 low. However, the previous key support near $0.3480 is currently acting as a strong resistance. The next key resistance is near the $0.3500-0.3510 area. Besides, the 50% Fib retracement level of the recent decline from the $0.3746 high to $0.3281 low is also near the $0.3510 level. Therefore, a break above the $0.3510 level is needed for buyers to regain control in the near term. Looking at the chart, ripple price could decline once again towards the $0.3300 support and the 100 hourly SMA. However, downsides could be contained as the price is likely to bounce back as long as it is above $0.3280 and the 100 hourly SMA. If there is a close below the 100 hourly SMA, the price might slide back towards the $0.3000 support area. 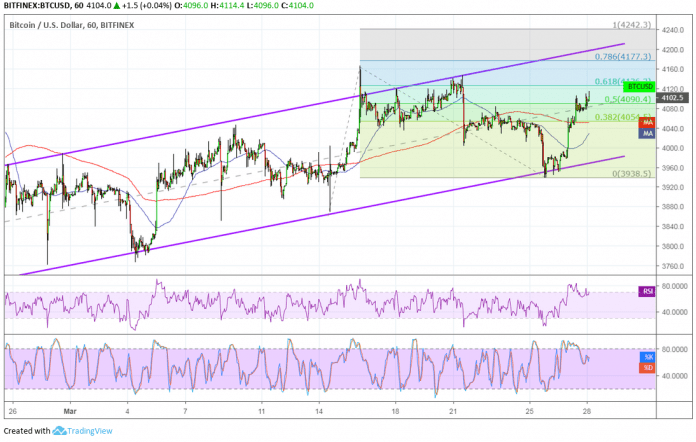 Hourly RSI (Relative Strength Index) – The RSI for XRP/USD declined sharply below the 50 level and it is currently near 40. Major Support Levels – $0.3320, $0.3300 and $0.3280. Major Resistance Levels – $0.3480, $0.3500 and $0.3510.